This date range utility takes a table and, for any date fields within that table, shows the distribution of dates by month and year. A date range summary is useful when you need to know the overall time period covered by a data set. It is also useful to determine if the data contains any significant gaps. When you are working with a new data set you may want to ensure the completeness of the data. 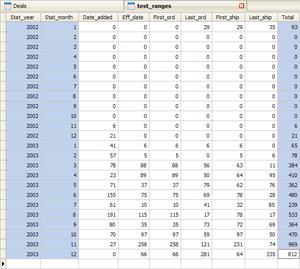 One thing you can do to assess completeness is to check the date ranges covered in the data. So, if the data set is supposed to be for the year 2007, you may expect to have a few outlying dates in December 2006 and January 2008, but a fairly consistent date count each month in 2007. If the distribution differs significantly, you may need to investigate the cause prior to performing other analysis. This type of testing for completeness is essential whether you’re consolidating data from multiple systems or tables, importing data from one system to another or preparing for some other type of data analysis. After installing the extension, select “Analyze Date Ranges” from the Tools menu and the date range dialog will appear. Click the Browse button to select the table in your project you wish to analyze. The Available Fields will populate with the fields in this table. Select the date fields you wish to analyse by highlighting them and clicking the arrow buttons. Note that if you select fields that aren’t dates, your output may include skewed data. Type in an output table name and then click Run. 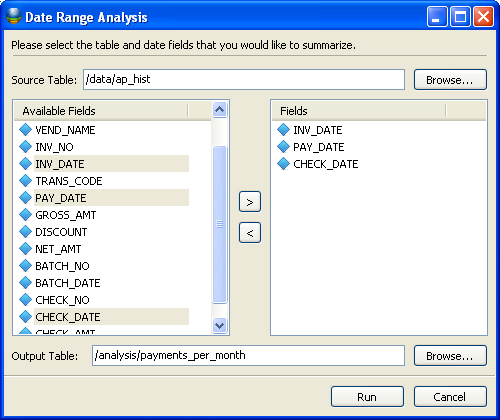 The analysis will run and produce a date range table for your review. On the left will be two fields, stat_year and stat_month, which are the months in your date range. The date field names will contain a count of how many times the date appeared in that month/year combination. On the far right will be a total count of all the date fields by month/year. 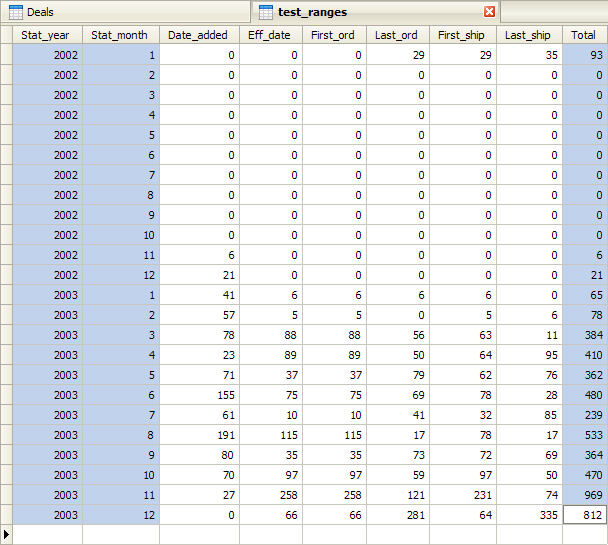 This will give you a snapshot view of the overall date distribution in your date table. Click on the above screenshot to expand it into a full view. Kirix Strata enables you to create plug-ins that extend the functionality of the software. This section is dedicated to showing off the extensions people have created. Feel free to download any of them and try them out. If you have one you'd like to list, please let us know. Get the Extension RSS Feed here.